With Saudi Deputy Crown Prince Mohammed bin Salman’s ongoing visit to Beijing making headlines, it is a good time to ask whether the Saudi-Chinese partnership is living up to its potential. Much has been made of the relationship in previous years and with good reason: Saudi Arabia is the world’s largest oil exporter and China is the world’s largest oil importer. It is unsurprising then that the two countries are eager to work together. China is also seeking to upgrade its status in the Middle East while Saudi Arabia is trying to hedge its bets in a multipolar world, especially when the US seems less willing to act as Saudi Arabia’s security guarantor. On paper, the Saudi-Chinese relationship makes a lot of sense. But how has it faired in reality? The Saudi-Chinese partnership is relatively young. After being firmly anti-communist during the Cold War, Saudi Arabia was the last Arab country to officially recognize the People’s Republic of China when it did so in 1990. 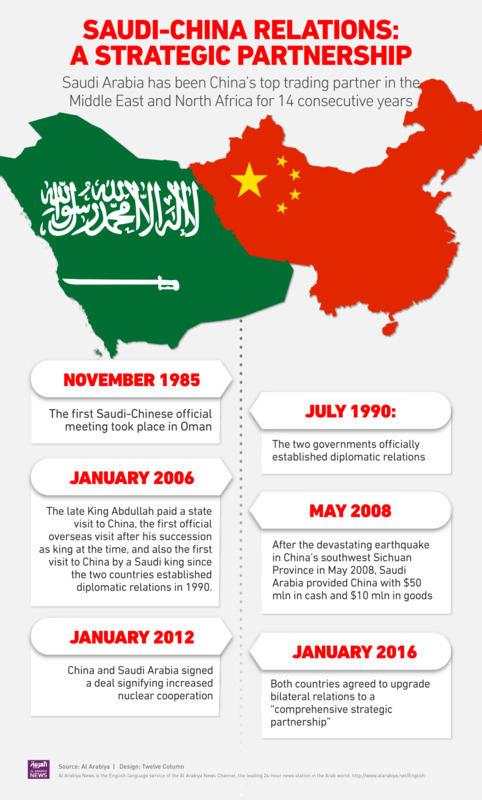 Chinese President Jiang Zemin was the first Chinese head of state to visit Saudi Arabia, where he signed a Strategic Oil Cooperation agreement in 1999. Since then, there have been multiple visits by kings and presidents of the two countries and several significant agreements, primarily on energy cooperation. At the start of this year, after a visit by Chinese President Xi Jinping to Riyadh, the two countries agreed on a more comprehensive strategic partnership that would include cooperation in economic, political and military fields. In the economic realm, the partnership has been an astounding success, most recently evidenced by the 15 agreements and memorandums of understanding signed on Tuesday. The agreements range from understandings on energy development and oil storage to cooperation promises on housing development and water resource issues. Meanwhile, Huawei, a leading global ICT solutions provider, on Wednesday received an investment license from Saudi Arabia. 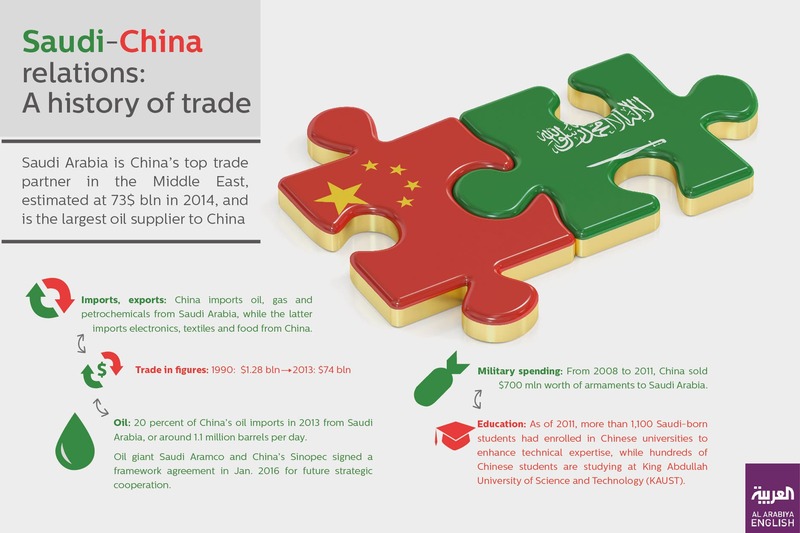 Saudi-Chinese trade exploded from around $1 billion in 1990 to more than $70 billion by 2013, surpassing Saudi-US bilateral trade in the process. 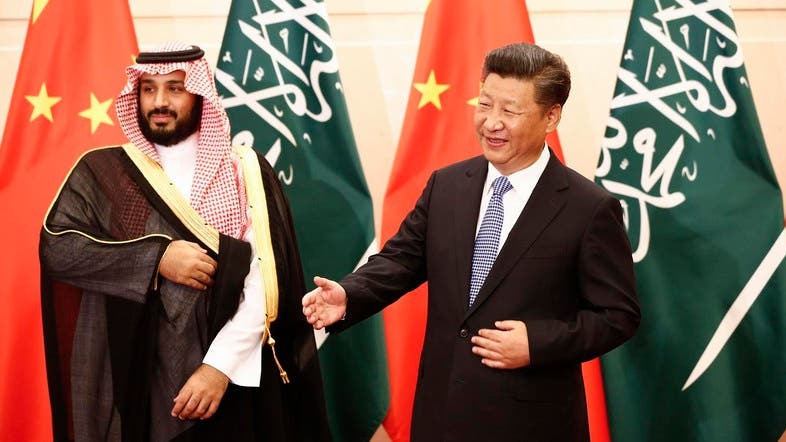 China is Saudi Arabia’s largest customer for oil and Saudi Arabia in turn is China’s largest provider of oil, meeting around 20 percent of Chinese demand. Additionally, Saudi Arabia is a lucrative market for Chinese consumer goods and an attractive country for investment. Put simply, oil flows to China while investments and consumer goods are shipped back to Saudi Arabia. When it comes to economics, the Saudi-Chinese partnership has absolutely delivered on its promise. But the really interesting questions have always involved moving beyond oil and economics. Can China and Saudi Arabia deepen their political and military ties? The US began its relationship with Riyadh with oil, but over the years it transformed into something much broader. Many analysts believe China can do the same. This is increasingly likely, they argue, because of the recent strains in Saudi-US relations. There is a growing sense among Saudis that it is not wise to be overly dependent on the US. These concerns have reached new heights after the lifting of sanctions on Iran, Obama’s reversal on his “red line” decision to strike Bashar al-Assad and America’s refusal to support Egypt’s Hosni Mubarak during the Arab Spring. China, in turn, increasingly wants to be seen as a great power and has grown considerably more dependent on Middle Eastern oil in the last decade. Given this context, it is unsurprising that security cooperation between Saudi Arabia and China has improved in recent years, highlighted by a “goodwill” visit of the Chinese navy to Jeddah for the first time in 2010 and Chinese arms sales to Saudi Arabia worth around $700 million from 2008 to 2011. But there are also complicating factors to the broadening of this partnership. China is improving ties with Iran as well as Saudi Arabia. Beijing and Riyadh also do not see eye-to-eye on several important issues, including the Syrian civil war. Perhaps most importantly, China has shown neither the willingness nor the capability to take over the role the US currently plays in the region. Chinese arms sales to Riyadh may be in the hundreds of millions, but in 2011 alone the US sold over $33 billion to Saudi Arabia. In the short run at least, the Saudis will continue to look to the US for military and political support and the partnership with China will remain primarily economic. The partnership between the two countries can still be accurately described as it was by Nasser Al-Tamimi in his 2013 book on the topic: “The Relationship between Saudi Arabia and China suggests (at least for now) that this is an energy-economic partnership not military-political alliance.” In the past several years, the potential for military-political cooperation has increased, especially as America’s appetite to play a role in the Middle East is diminishing while that of China is growing. Yet relationship between China and Saudi Arabia continues to be one dominated by the economics of oil. Has the potential of the partnership been met? In economic terms, absolutely. As a strategic partnership with a political and military component? Not yet. But Deputy Crown Prince Mohammed bin Salman and Xi Jinping both know that the Saudi-Chinese partnership is still young and that there are many untapped opportunities.